Fat City Fit: Workout Wednesdays - should women lift weights? 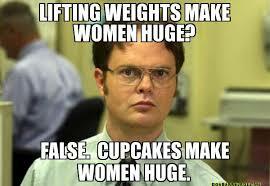 Workout Wednesdays - should women lift weights? 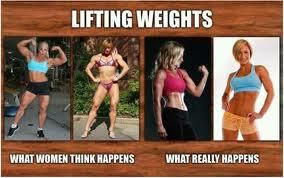 Women shouldn't lift weights. It makes women huge and man- like. It will make you look fat and large. You shouldn't lift weights if you're a woman. You should do cardio and lots of it. That is all lies! Big LIES! A cardio only workout regime does work your heart but it will only serve to make you skinny fat (if skinny at all) and will leave your body in high cortisol state (cortisol is that nasty steroid hormone that tells your body not to let any fat go lest a famine or some other danger befall you). 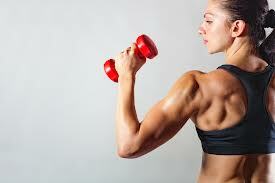 Weight training builds muscle mass and muscle mass is what burns real calories. While the exact extra number of calories burned by muscles versus fat is highly contested, the fact that muscles do burn more calories, even at rest, is not. Weight training provides a quick way to move through your workout, build muscle and keep burning calories long after your workout ends. And trust me, unless you're taking steroids, you are NOT going to man-huge! You're going to lean and curvy and fit! So go lift weights! Don't know what to do in the weight room? Email me at julia.k.connolly@gmail.com for customized programs or post in the comments below!